The Surround Air Multi-Tech II XJ-3000D Air Purifier is the most powerful of the XJ-3000 series – 6 proven air-cleaning technologies in one unit for virtually every pollutant type. The XJ-3000D removed 99.5% of particles in air chamber testing.† †Results may vary. Why Purchase the Multi-Tech II XJ-3000 D Air Purifier? Outperforms other top-rated air purifier models in toxin tests! Nearly 100% effective in clinical tests, and five times more effective in toxin removal test than the competition. Also killed 100% of aspergillus mold in clinical tests. 1. True HEPA Filter for the most effective protection against dust & allergens, such as pollen, ragweed, mites and mold spores. HEPA filters are recommended by the Department of Homeland Security and the U.S. Centers of Disease Control. 2. Germicidal UV Lamp to destroy micro-organisms such as germs, viruses, bacteria and fungi (such as mold toxins). Recommended by the U.S. Centers of Disease Control and the Air Institute of Respiratory Education. Also disinfects the micro-organisms that are trapped in the HEPA filter, which is why the CDC recommends using a germicidal UV lamp and HEPA air filter together. The second UV lamp in the Multi-Tech XJ-3000D can be turned on when extra sanitization strength is needed. 3. Activated Carbon Filter for chemicals, gases odors and cigarette smoke. The most absorbent filter material known to man. Recommended by the Centers of Disease Control, the Dept. of Health and Human Services and the National Institute of Occupational Safety and Health. 4. Ionizer which disperses negative ions to seek out and remove particles & bacteria from the air. Proven by government studies to be effective, and to enhance performance of filters. Found to be highly effective in multiple U.S. Dept. of Agriculture studies. 5. Programmable Sanitizer to neutralize powerful odors. Can be completely turned off when not needed. Includes High, Medium and Low settings for appropriate output according to need. 6. Anti-Bacterial Pre-Filter for larger particles, lengthening the life of the other filters. Pre-filters are recommended by the Dept. of Homeland Security. The pre-filter is the first in line. Preserves the life of other filters, so more pores can remain available in the activated carbon and HEPA air filters for the finer, harder-to-remove pollutants. Helps to eliminate bacteria to help prevent them from reproducing and recirculating into the air. The activated carbon is next in line after the pre-filter. The best type of air filter for trapping chemicals, gases, odors and cigarette smoke. According to Penn State Dept. of Aerobiological researchers, carbon filters serve to remove odors, volatile organic compounds (VOCs) and chemicals that other filters cannot. After the air has moved past the pre-filter and carbon filter, removing larger particles, many bacteria, chemicals, odors, etc., it comes to the thick layer of HEPA filtration. Removes 99.97% of particles (at .3 microns in size) that pass through the filter, as verified through strict testing procedures. Largely considered the most effective type of air filter for solid particles, such as dust and other allergens, such as pollens, pet dander, mold spores, ragweed, dust mites, etc. 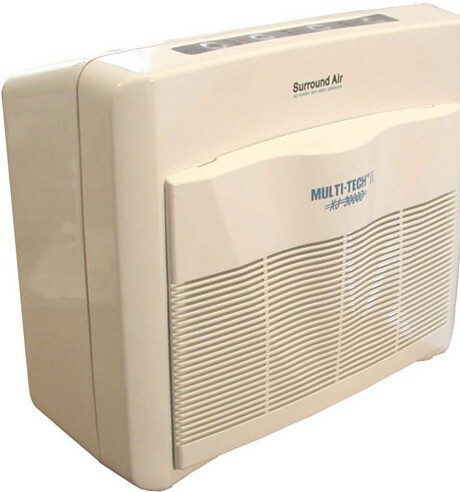 HEPA filters are recommended by the U.S. Department of Homeland Security. The UV lamp is positioned behind the HEPA air filter. The UV lamp destroys the micro-organisms (such as viruses and some bacteria) that cannot be captured by filters. Destroys micro-organisms. UV light is scientifically proven to destroy viruses, germs, bacteria, fungi (including mold), etc. Reduces illness & disease. UV light has been used for years by the medical field to sanitize rooms and equipment, and to prevent the spread of illness and disease. Recommended by Centers for Disease Control (CDC) for its ability to destroy biological pollutants. Sanitizes the HEPA Air Filter. This powerful UV lamp is positioned where it can effectively sanitize the Hepa air filter. The sanitizer is completely programmable. If turned on, it ozonates the air as it passed through, along with the air in the room. It also provides added UV sanitization. This function can be turned off completely if not desired or needed. Ozone Free Operation. By default, the ozone sanitizer is disabled. If activated, ozone output can be set to Low, Medium or High. Powerful odor eliminator, which is a weakness of most other air purification methods. The ionizer is located just inside the air outlet. It circulates air-cleaning negative ions into the air. Effectively removes particulate from the air, such as bacteria, smoke, and allergens such as mold and dust mites. Circulates ions throughout the room, in areas where the filter has little effect. Increases the effectiveness of the HEPA by causing smaller particles to conglomerate into larger particles, according to Journal of Hygiene. Government studies show negative ions to be effective at removing dust and micro-organisms from the air (U.S. Dept. of Agriculture). Ozone Free. The ionizer does not produce ozone as a byproduct.